It has been a number of weeks since I published a post but now I’m back on task until mid December. The time is passing so quickly that it’s hard to believe once we all get over Christmas Thriveabetes will only be around the corner. Advance registration is required to attend Thriveabetes and you can register here. I’m doing a series of posts that will feature some elements of the conference the team has put together. This is the second, the first highlighting what is in store for an adult living with type 1 diabetes which you can read here. Naomi was diagnosed with type 1 diabetes at 15. She is married and has one, happy and healthy daughter. She is a qualified fashion stylist and is the owner and creator of the award winning blog, The Style Fairy. Having spent 2 years working in the fashion industry in Sydney and Singapore, Naomi moved back to Dublin to set up her own business in 2013 and so began The Style Fairy. As well as a Business degree from Trinity College, Dublin, Naomi has a diploma in Fashion Buying & Merchandising coupled with a Diploma in Professional Styling for TV & Film. She writes about affordable, attainable, real life fashion and beauty as well as showcasing her personal style in her ‘Outfit Diaries’ segment, which is one of the most popular elements of her blog. Before she moved to Ireland, Kate had worked for many years as a diabetes educator, psychoeducator and insulin pumps certified trainer in one of the biggest pediatric diabetes Centres in Warsaw, Poland. Her project ‘Edu-Diabetes’ aimed to educate people in all age groups on how to live well with diabetes. Kate has been living with type 1 diabetes for over 30 years. She is a also a psychologist and currently a Doctorate candidate at the Royal College of Surgeons in Ireland. She is conducting a study looking at the access to insulin pump therapy in Ireland. In her free time she likes to run, sail, dive and travel and spend time with her 1 year old daughter, her husband and two pets. Four days after experiencing the euphoria of Dublin winning the 2011 All Ireland Final, he was diagnosed Coeliac disease. Three months after that, in December, he was diagnosed with Type 1 Diabetes. After weeks of sitting out training he did finally get back out with the team and played to another victory in 2013. He no longer plays at Senior level and is a teacher based in Lucan. James was diagnosed with Type 1 Diabetes in October 2006. He is from Kilkenny but currently living in Cork. He started cycling In the summer of 2011, while on holiday in the U.S. In 2013, he started taking part in some local charity cycles. However based on medical advice he was only doing rides of up to two hours in duration. It was only out of curiosity that he did a google search for “professional athletes with type 1 diabetes” that he realized he could go beyond. He started following the NovoNordisk Team Type 1 professional cycling team and broke through that barrier. In 2015, James was featured in an Irish Times article because he took part in the 2015 mHealth Grand Tour which involved a 1,500km cycle with 20,000 metres of climbing over 10 days with 26 riders, all with type 1 diabetes. And in 2016, he took part in Team Novo Nordisk’s Development Camp. James wrote a blog post for Thriveabetes just before he went off on this trip. You can read it here. I think you will agree that these four individuals will inspire and motivate everybody who attends Thriveabetes 2018. 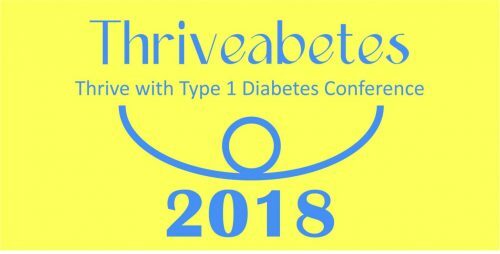 Thriveabetes 2018 takes place on Saturday 24th February in Dublin. Thriveabetes; The Thrive with Type 1 Diabetes Conference is a one-day conference for all people living with type 1 diabetes. This Type 1 Diabetes conference focuses on the psychological impact of living with a chronic, lifelong condition. We aim to provide “Inspiration, Motivation and Information” to all people living with type 1 diabetes (adults, parents & children). Advance registration is required and you can find out more about our amazing event here.